Today S.K. Rizzolo is here with an entertaining post about political scandals, early 19th-century style. 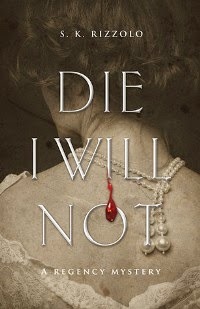 Die I Will Not, third in her Regency mystery series, was published in November by Poisoned Pen Press (279pp, $14.95 pb/$24.95 hb). Nowadays we are all too familiar with living under the public gaze, but this phenomenon is not new. Set in 1813 London, my novel Die I Will Not explores royal scandal, early 19th-century journalism, and dirty politics. As I researched these topics, I became fascinated by the idea of individuals struggling to preserve their privacy under the ubiquitous modern gaze—a gaze feeding voracious scandals that often refuse to die. Perhaps in our own era of 24-hour news cycles trumpeting the latest brouhaha, readers can relate. I learned that “spin” is by no means a modern concept. It was common in Regency England to insert a “squib,” a short, satirical paragraph, in the papers to lampoon one’s enemies, or one could purchase a “puff,” extravagant praise designed to polish up one’s image. The royals were not immune from this scramble for positive press. Indeed, the Prince Regent (later George IV), who was very sensitive to public perception, often sent his secretary Colonel McMahon to the newspapers to bribe or browbeat the editors into withholding or publishing information. No one experienced the glare of scrutiny more relentlessly than the unpopular Regent and his detested wife Caroline. Both sought to manage their reputations in “the public mind,” and I would argue that both ultimately failed, though, as we shall see, Caroline scored some notable triumphs over her husband. My character Penelope Wolfe also struggles with scandal and a tarnished reputation, at one point waking “to find herself notorious.” Penelope is the daughter of a radical philosopher suspected of treason and murder. She is also the target of sly innuendos about her rocky marriage to a spendthrift artist as well as her relationships to my other sleuths, barrister Edward Buckler and Bow Street Runner John Chase. I found it interesting to parallel her experiences to Caroline’s: two women, two “injured mothers” attacked in the press for a presumed loss of virtue. In Caroline’s case, the Prince had instituted an inquiry into her conduct, which came to be known as the “Delicate Investigation.” Well, it’s hard to imagine anything less “delicate” because the agents were busy interviewing her reputed lovers and accusing Caroline of having borne an illegitimate child. The investigators even grilled the poor woman’s laundry maid and other servants to find out what she’d been up to. But in the end the Regent’s attempt to divorce his wife had failed when she was cleared of the primary charge. Her defender Spencer Perceval summed up what may have been the general view at the time: “I believe the princess to be playful, and incautiously witty, in her deportment; but I prefer that to secret intrigue and infamous practices." In other words, she had become the sympathetic victim of her royal husband’s scheming. One hack writer even made her the heroine of a Gothic romance. 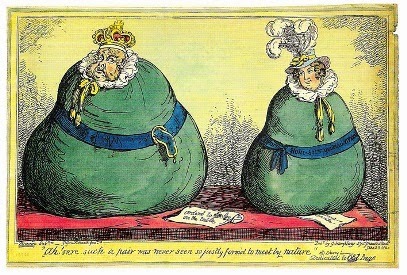 This Cruikshank caricature depicts George and Caroline as the plump green bags that contained the evidence collected against Caroline in preparation for her trial in the House of Lords. As the caption aptly puts it, “Ah! sure such a pair was never seen so justly form’d to meet by nature.” One notices, however, that George is rather more rotund than Caroline. So the nasty scandal that erupted in the spring of 1813 was only the latest salvo in a long-running war between Caroline and George—but this time she fired the first shot. Despite having earned a somewhat qualified verdict of innocence in the Delicate Investigation of 1806, Caroline’s contact with her daughter Charlotte, heiress to the throne, continued to be restricted. In response, Caroline wrote the Regent a letter, and when he declined to read it, she sent this letter to the newspapers, sparking a national uproar. The “Regent’s Valentine,” published on February 10, 1813, masqueraded as an appeal to her husband’s better nature but was actually a wily move on Caroline’s part to drum up public support. By the way, Henry Brougham, the opposition lawyer and politician, was said to have composed this letter for Caroline—for, of course, the Regent’s political enemies, Whigs and radicals alike, were all too eager to make use of his domestic discord for their own purposes. Excerpts from the letter were even printed on commemorative china! When the furor finally subsided, Caroline was the undisputed victor in the publicity battle, the Times having declared her “complete innocence” and the Lord Mayor having organized a proclamation and procession in her honor (according to one source, “the Prince Regent, foaming with impotent rage, found it convenient to go out of town that day”). Amid rumors that he had been planning to revive the Delicate Investigation in yet another vindictive attack on his wife, he essentially slunk away in shame. But by 1814 Caroline had left England for the Continent, where she shocked Europe by frolicking with her Italian servant Bartolomeo Pergami, before returning to England in 1820 to face divorce proceedings in the House of Lords. She beat her husband this time too. After passing the Lords, the divorce bill was abandoned because of the enormous public outcry in her favor. Sadly, Caroline died a few weeks later after trying and failing to storm Westminster Abbey in order to join her husband’s coronation. And what has been history’s verdict? Dr. Steven Parissien titles his article for the BBC “George IV: A Royal Joke” and quotes from an obituary, which states, “At an age when generous feelings are usually predominant, we find him absorbed by an all-engrossing selfishness, not merely careless of the feelings of others but indulging in wanton cruelty.” Though George is often acknowledged as a patron of the arts, his poor reputation has refused to die, echoing down the centuries, labeling him bloated, dissolute, profligate, and ungrateful. How’s that for an image problem? And though I think that Caroline has fared better under the public gaze, probably because she figures as a persecuted woman, she too has image problems. With some justice, she is often said to have been vulgar, smelly, and promiscuous. I’ve often wondered why anyone could wish for immortality when so often one is left with mud all over one’s face. 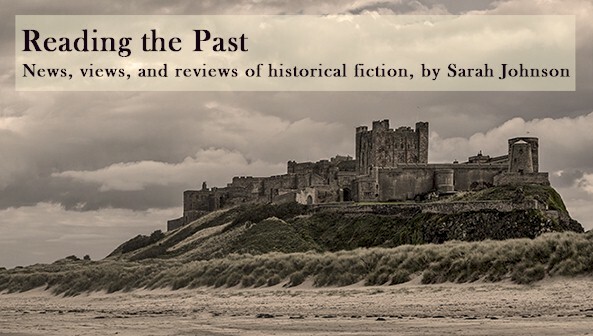 I wonder too how many of our own 21st-century scandals will live on to become the subject of historical novels. S.K. Rizzolo is a longtime Anglophile and history enthusiast. An English teacher, Rizzolo has earned an M.A. in literature. She lives in Los Angeles with her husband and daughter. Set in Regency England, The Rose in the Wheel, Blood for Blood, and Die I Will Not are the three titles in Rizzolo’s series about a Bow Street Runner, an unconventional lady, and a melancholic barrister. About Die I Will Not: Unhappy wife and young mother Penelope Wolfe fears scandal for her family and worse. A Tory newspaper editor has been stabbed while writing a reply to the latest round of letters penned by the firebrand Collatinus. Twenty years before, her father, the radical Eustace Sandford, also wrote as Collatinus before he fled London just ahead of accusations of treason and murder—a mysterious beauty closely connected to Sandford and known only as N.D. had been brutally slain. Now the seditious new Collatinus letters that attack the Prince Regent in the press seek to avenge N.D.’s death and unmask her murderer. What did the dead editor know that provoked his death? Her artist husband Jeremy being no reliable ally, Penelope turns anew to lawyer Edward Buckler and Bow Street Runner John Chase. As she battles public notoriety, Buckler and Chase put their careers at risk to stand behind her and find N.D.’s killer. They pursue various lines of inquiry including a missing memoir, Royal scandal, and the dead editor’s secretive, reclusive wife. As they navigate the dark underbelly of 1813 London among a cast driven by dirty politics and dark passions, as well as by decency and a desire for justice, past secrets and present criminals are exposed, upending Penelope’s life and the lives of others. Am reading Henry James' letters and just thought people might enjoy him on the difficulty of writing a good historical novel: "the real thing is almost impossible to do, & in its absence the whole effect is as nought; I mean the invention, the representation of the old consciousness, the soul, the sense, the horizon, the vision of individuals in whose minds half the things that make ours, that make the modern world were non-existent."